One of the major factors re-enforcing China’s wealth gap is the disparity in education between children of the rich and the poor. This piece in Time from a few days ago underlines how the educational failure in rural areas could seriously damper China’s growth in the near future. Since the 1990’s, the proportion of rural students in China’s universities has been dropping steadily. The percentage at Peking University has fallen from 30% to 10%. And at Tsinghua, rural students make up only 17% of the student body in spite of accounting for 62% of the entrance exam takers. Last summer I interviewed analyst Pablo Zoido with the Programme for International Student Assessment (PISA)– which is affiliated with the Organisation for Economic Co-operation and Development. He has conducted studies specifically on how disadvantaged students can overcome their socio-economic background and perform on par with their affluent peers. Obviously adequate funding and getting good teachers to these poor schools is very important, but there are many relatively cheap measures that can be taken which produce big results. Zoido shared some interesting (and somewhat counter-intuitive) findings regarding the role of standardized testing, confidence and how some Chinese cities are actually leading the world in fostering educational equality. Question: What have your studies shown is the most important factor in closing the gap between rural and urban students’ performance? Zoido: The first thing is opportunity to learn. 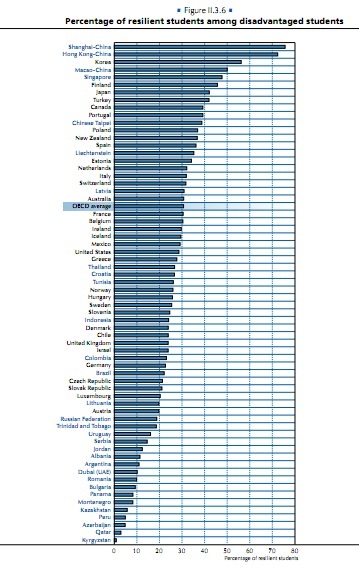 Across many different countries disadvantaged students tend to spend less time at school and that obviously has an impact on their performance. Having an extra hour of class time also seems to benefit disadvantaged kids more than advantaged. It could be the fact that it keeps disadvantaged kids from doing something else that wouldn’t be particularly beneficial for their performance; whereas advantaged kids not being in school might just mean that they’re learning something else or getting support at home where they tend to have more educated parents and more educational resources. Q: Your report also indicates self-confidence is a major factor in performance. Zoido: Kids being more debated, more engaged, interested, and self-confident in their abilities is related to performance. Motivation is important for all kinds of kids regardless of their background and it could be key to improving their performance. Incidentally there’s a lot of evidence in our studies that educational aspirations play a big role in bridging this gap. But this works across all kinds of students. So any sort of policy should be targeted to disadvantaged kids to overcome support that advantaged kids get at home. Q: How can you foster this motivation? Zoido: In terms of educational expectations, kids can be given clear information about the types of opportunities they’ll have in the future. Also role models in the kinds of professions they might want to aspire to later on. Encouraging disadvantaged kids to participate in, or even organize, extracurricular activities like science or math clubs can also help. Q: Does having a single standardized test like the Gaokao have any bearing on the urban-rural gap? Zoido: There’s no sort of evidence for that. Memorization of course is something we always find doesn’t help performance and is sometimes negatively related. But in our studies, we don’t test kids on the knowledge they acquire at school but whether they can use that knowledge in novel situations in a somewhat creative way. Chinese students perform very well on these sorts of tests. So we think that this suggests the myth that Chinese or Asian education just focuses on rote-memorization isn’t completely right. Q: One of your studies found that Hong Kong and Shanghai top the world in the percentage of disadvantaged students who overcome their background and perform on par with their advantaged peers. This seems counter-intuitive. Zoido: What’s really surprising and extraordinary in the performance of Shanghai and Hong Kong is that, in spite of having populations very diverse in terms of socio-economic background, kids do well across the board. So there’s a very weak relationship between socio-economic background and performance there. There was a case study of Shanghai and it found one of the main driving forces for the good performance was collaboration across schools. Whenever there’s a weak school, stronger schools will send their management teams and teachers to these weaker schools to turn them around and make them a success. It also happens that this becomes a particularly good career promotion for the people involved in turning the school around. So there seems to be a whole system in place to ensure that, rather than having a huge school that does very well, all schools do well more-or-less at the same level. That’s our best guess but we don’t have a lot of evidence on exactly what’s driving that. Q: Could internet education in the countryside help close the performance gap? Zoido: We have a report looking at this and I think the main message was how hard it is to take advantage of internet education technologies. We think the key there isn’t only providing more access and more opportunity for kids but also training teachers in how to use it effectively and how to integrate it into the overall pedagogy of the curriculum. It’s a tricky issue. Q: Do you think affirmative action initiatives like extra points on the Gaokao for rural students are good ways to bridge the divide? Zoido: What other countries show is that, when you’re at the university level, it’s probably already too late. What seems to be happening in countries that do very well across the board like Finland and Canada is that there are sort of early warning mechanisms for schools to identify kids who are, perhaps not already doing very poorly, but are at risk of doing poorly. Once these kids have been identified they spend extra time in school or are taken into smaller groups and given support for the particular subject where they’re falling behind. Not waiting until it’s too late with rural students is important.